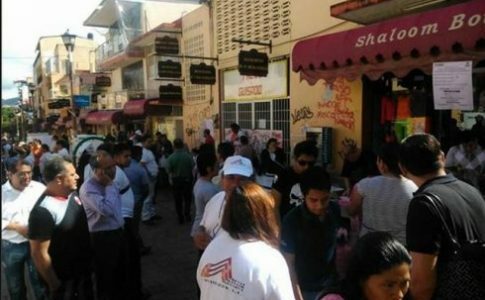 A few hours before the opening of the election polls, a large number of troops from the navy, army, national guard, federal, state and municipal police as well as “thugs” and para-military groups were sent into Guerrero, Oaxaca and Chiapas to secure the elections. 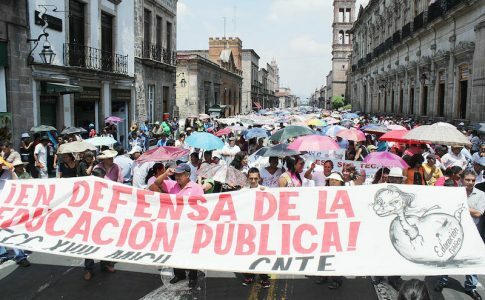 Thousands of teachers from the National Teachers Coordinator (CNTE), along with students, social organizations, the parents of the 43, local farmers, and popular sectors have been organizing a great mobilization for the past few days in order to boycott and stop the elections. Up until Friday, Lorenzo Cordova, the president of the National Electoral Institute (INE), was announcing his guarantee that the elections were going to take place throughout the whole state of Oaxaca. The actions taken by section 22, section 18, and 7 of the State Coordinator of Education Workers in Guerrero (CETEG) alongside popular sectors to boycott the elections demonstrates the profound hatred and out right questioning of this “democracy” and their militarized elections. After 72 hours the following has taken place: In Veracruz students and activists houses were raided by paramilitary and “thugs” heavily armed, resulting in a number of injuries; 2 students from the Autonomous University of Puebla (UAP) were detained and accused of a bomb attack; a professor is dead and a student teacher (normalista) is in a coma after confrontation between the police and armed civilians. There is a report for 2 missing students. Also, organized “thugs” in Pachutla attacked teachers from the 22nd section of CNTE who had taken over a gas station. A few hours ago in Xolapa, Guerrero, the “community police” was unarmed and 10 members were executed without any kind of trial. 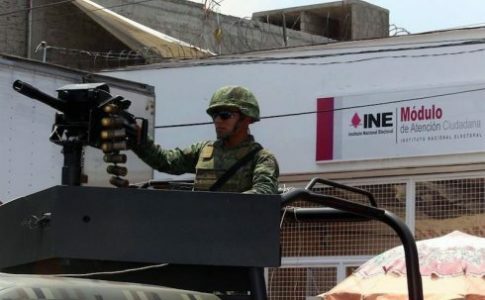 Tanks, helicopters, artillery units and hundreds of other army materials flown into Oaxaca by military planes have been arriving in preparation for the elections. This is an unprecedented situation in which they are forcing the population to vote with a gun to their backs. It is a clear example of how degraded and illegitimate the regime has become. These elections are militarized, revealing just how profoundly undemocratic and reactionary the capitalist system really is in its attempt to legitimize an election that has been heavily questioned. 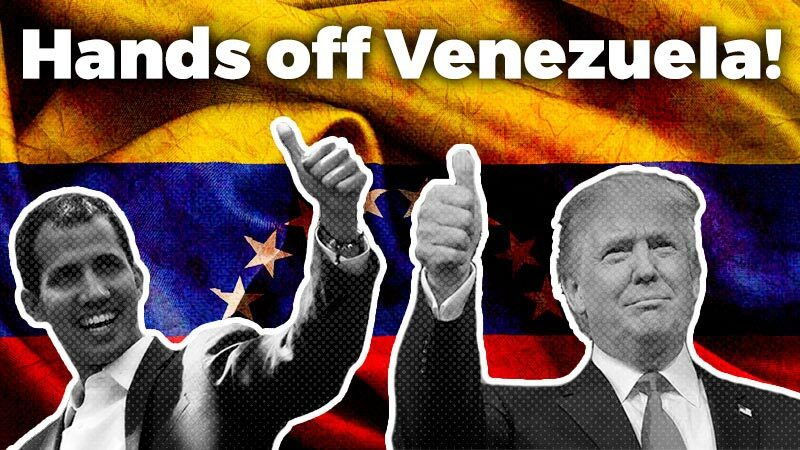 The PRI party and all the parties of the regime, are willing to continue their plans to give away the nation resources in favor of U.S. imperialism, no matter what the cost. 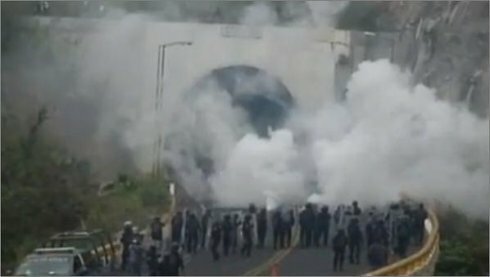 In the next few hours there is a possibility of new confrontations with the army and the police in the states that are mobilized, especially in Atyotzinapa, where last night students were denouncing that the electric power had been cut off and there were threats that the police would enter the student campus. Meanwhile, the PRD governor Mancera has withdrawn all the police from Mexico City to the barracks so that they can be deployed to the election polls today Sunday the 7th, in order to guarantee a “peaceful” election day. Due to the mobilization of armed forces, and the virtual “state of siege”, human rights groups have begun to denounce horrendous human rights violations by the State. 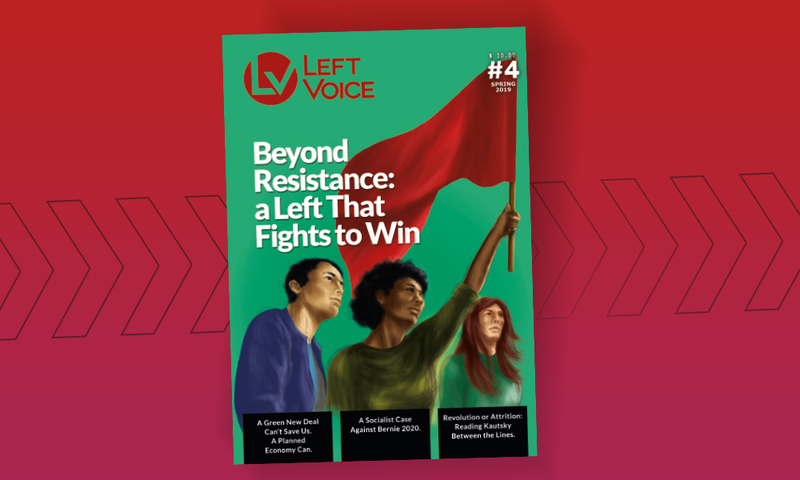 This repressive dynamic is similar to the one that began with the inauguration of Pena Nieto’s government back in Dec of 2012, when mobilized popular sectors protesting Pena Nieto’s elections were severely repressed. Nothing good can become of the “democracy for the rich” proposed by the parties of the regime, PRI, PAN, PRD, PVEM. They can only have more repression, misery, hunger, unemployment and exploitation to offer. 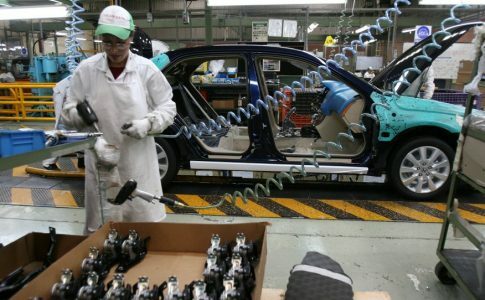 It’s necessary to take the struggles of the San Quintin laborers as an example, along with the workers of the Triumph multinational, the miners of Cananea and other sectors that are mobilized despite the militarization, the “narcos”, the para-military and this terrible attack by the bosses and the government. This is why we are calling on all the unions who call themselves democratic, social organizations, civil and human rights groups, rural workers, women, indigenous communities, and students to begin organizing a great democratic movement on the streets to stop the militarization of the country and to organize ourselves independently from the parties in power in order to stop the attack.